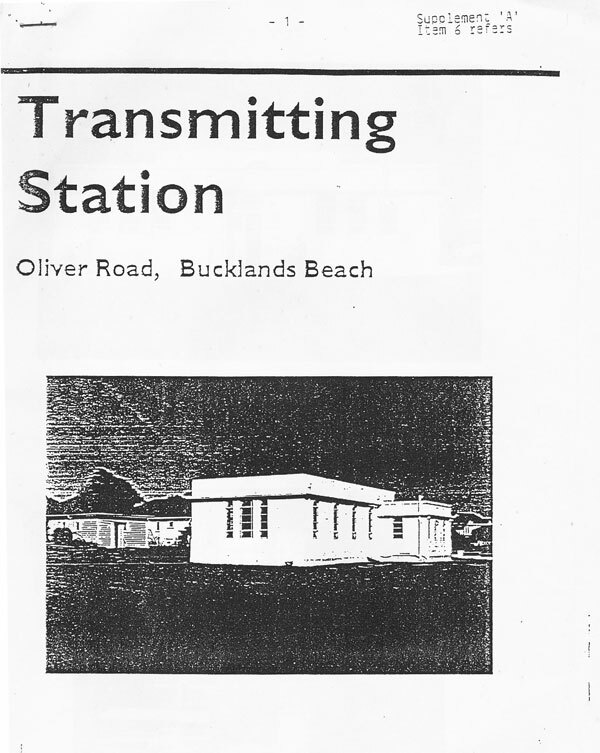 This document appears to have been prepared for Manukau City Council in 1994, and proposes that the Council acquire the former transmitting station of Auckland Radio. The proposal did not succeed, and the transmitter building was demolished. 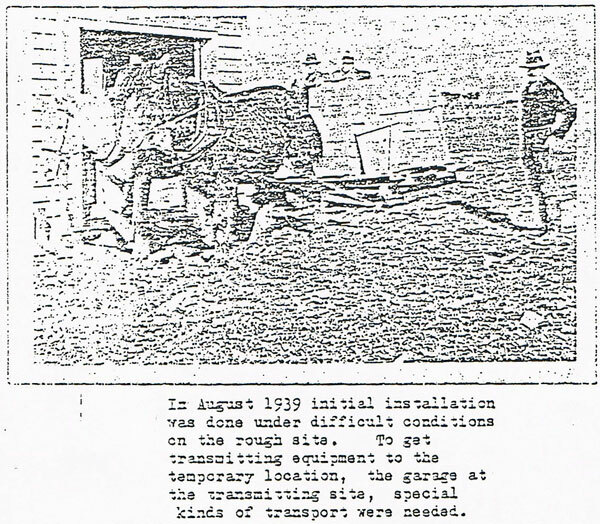 The text below was retyped from an old photocopy which also contained numerous photographs placed within the text. These had been very poorly reproduced in the photocopying, so wherever possible they have been replaced by better quality versions of the same photos, in the same positions. Unlike the source document, the photos have been captioned for clarity. Auckland Radio transmitter building in Oliver Road. Date unknown. MUSICK POINT: Receiving & Transmitting Stations. John Blake-Kelly FNZIA, ARIBA, FRSA, (b.1913, 3.1988) was Government Architect from December 1971 until his retirement in June 1973. Prior to this he had a long career as an architect in the Public Works Department, (later known as the Ministry of Works). Blake-Kelly was born in Auckland in 1913. Upon graduating Bachelor of Architecture from the Auckland University in 1937, he joined the Public Works Department as a draughtsman in the Auckland office. It was in this capacity had the designed the Mount Albert Telephone Exchange, New North Road (1941) and the Musick Memorial Radio Station at Howick (1941). At about this time also, his designs were awarded third place in competitions for Auckland’s Anglican Cathedral and the Michael Joseph Savage Memorial. After the Second World Ward, in which he served in the Royal Navy, Blake-Kelly was posted to the new position of sectional architect in Wellington. Here he was involved in the development of post-primary schools (built at Taita and Mana College). These came to be used as a national standard. 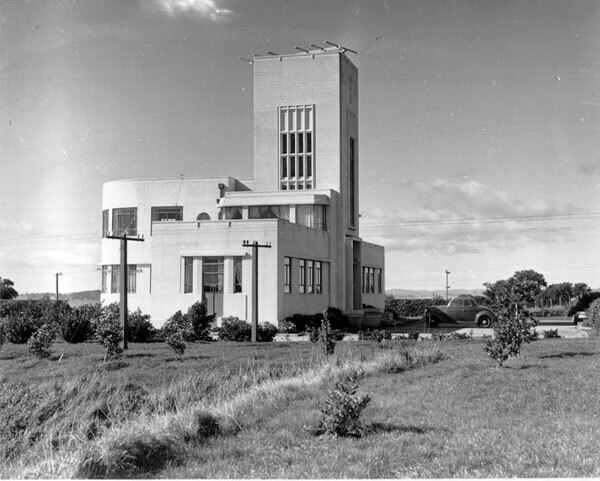 In 1952 Blake-Kelly was appointed District Architect, Wellington, where he was involved in Government projects from Gisborne to Nelson and Marlborough. During this period he was involved in the development of fairfaced concrete. Seven years later he was appointed Assistant Government Architect for design and construction of Government works including projects of considerable magnitude such as the science schools for Canterbury, Massey and Auckland Universities. He was also closely associated with the design of Auckland’s Paremoremo Maximum Security Prison (1969) and, as Chairman of the Planning Executive Committee, was responsible for design direction of the Auckland International Airport Terminal Buildings (1971). The transmitting station comprised a main transmitting hall (approx. 17 metres by 13 metres), an engine room (approx. 4 metres by 3 metres), a technicians’ workshop (approx. 5 metres by 3 metres), kitchen, storage room and toilet facilities. The influences of the Modern style, with its commitment to the aesthetics of the machine age are evident not only in the building’s shape but also in details such as metal framed windows divided by metal sash bars, light fittings and windows and door catches. Several flush panel doors on the interior have porthole windows. A circular window also occurs on the external wall on each side of the second-floor operations room. Circular windows with their nautical associations were an appropriate motif for a building from which amphibious flying boats were guided. 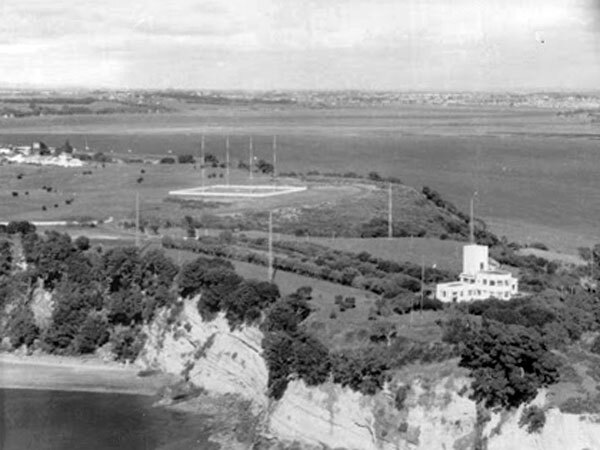 The Memorial Radio Station occupies the Musick Point promontory overlooking the Waitemata harbour. The building is approached by a formal driveway flanked by lawns and native trees. The driveway entrance is marked by two concrete pylons surmounted by flagpoles. The building makes its greatest impact when viewed from the harbour or from the air. The Transmitting Station, situated in Oliver Road, added to the visual impact, in that it was laid out to act as a matching pair for aircraft to use as a visual marker. The grounds are a popular amenity visited by Aucklanders at weekends. The Musick Point Memorial Building and Transmitting Building express modern life in an “aesthetic” which was developed by the modern movement architectures in Europe such as Gropius and Corbusier. The modern architects based their architectural forms on the products and methods of industrial technology; the ship, aeroplane and car, so that buildings too could be in contest with modern life. The two buildings are very early representations of their type. They are good examples in the New Zealand context, which adds to their importance as a regional asset. 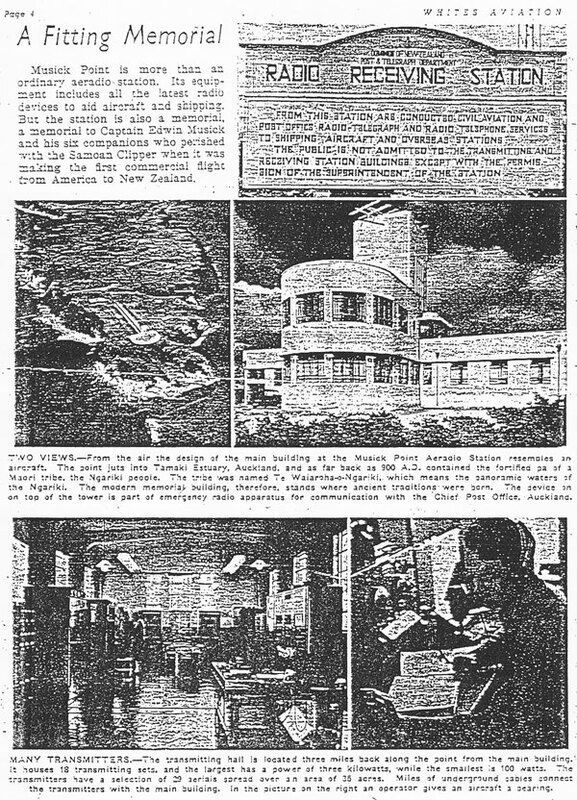 The Musick Memorial Radio Station, constructed in the shape of an aeroplane, has been little altered and retains its architectural integrity and memorial function. Designed and constructed when the international aviation industry was in its infancy, the building is a fitting tribute to American aviator Edwin Musick and his crew. The Musick Memorial Radio Station is a reinforced concrete building in the Modern style. At the time of its construction (by DC Street Construction Ltd, Hamilton) it was likened to the forepart of an aeroplane with two single-storied winds on either side of a tail tower. The driveway and grounds represented the jet-stream of an aircraft. The Transmitting Station at Oliver Road continued this theme. A two-storied, streamlined bay with generous windows represented the aircraft’s nose. The building is approached from the southern side via a formal driveway dominated by the tower. The vertical aspect of the tower is emphasised by a tall narrow bay of windows extending for the two of the three floors above the centrally located entrance. The main entrance opens into a small memorial hall approximately five metres square. Although this area serves as a central lobby, the height and symmetry of the hall bestows a form and dignity befitting its function as a memorial. The eastern and western walls bear an American Eagle in plaster relief and a bronze plaque. Plastered walls are a striated marking, also evident but less clearly defined on the buildings’ exterior. The floor is terrazzo. Above the memorial hall the tower rises three floors accommodating the former ground to air radio room, an equipment room and an emergency water supply respectively. A corridor runs from the memorial hall along the south side of each of the winds. The eastern wing was originally staff quarters. The eastern wing accommodates a work room and emergency general room. The main operations rooms were originally housed on both floors of the building’s curved northern section overlooking the sea. Administrative accommodation for superintendent and supervisor on both floors was divided from the main operations room by a low wall, however this space was later formalised by internal partition walls. The flat-roofed areas of the streamlined bay and wing sections provide a promenade. The Oliver Road transmitting site was one of the two essential components to the Musick Memorial Radio Station complex, the other being the receiving station. One could not operate without the other. To this end, the transmitting station was built in the same Modern décor. The transmitting stations is located three miles back along the point from the main building. It housed 18 transmitting sets in 1946, and the largest had a power of three kilowatts, while the smallest was 100 watts. The transmitters had a selection of 29 aerials spread over an area of 35 acres. Miles of underground cables connected the transmitters with the main building. The area of the transmitting site covered what is now the Ocean Point sub-division, existing transmitting paddock and the playing fields at Maclean’s College. The Musick Memorial Aeradio Station was officially opened on January 12 1942 by Prime Minister Peter Fraser. The building and headland upon which it stands takes it name from Edwin Charles Musick (b.1894-d.1938), a pioneer of long distance ocean flying. Captain Musick, one of Pan American Airways’ first pilots, surveyed various air routes and inaugurated scheduled airmail flights across the Pacific. On 22 November 1935 the flying boat “China Clipper,” under his command, landed at Manila having flown from San Francisco. This link established, the airline turned it attention on to developing a similar connection with the Australasian area in the South Pacific. Imperial Airways had already linked Australia by air with Britain, leaving Auckland as a Pan American destination, a four-day trip by air from California. On 30 March 1937 a crowd of 30,000 greeted the Sikorsky flying boat, called the “Pan Am Clipper II,” which landed on Auckland’s harbour. Skipper of this survey flight was Captain Musick. A second survey flight arrived at Auckland on Boxing Day of the same year. On this occasion, Captain Musick and crew were oficially welcomed by Prime Minister Michael Joseph Savage. The first airmail from New Zealand to America was carried on the return flight which left three days later. Just two weeks later, however, the inaugural commercial flight, again under Musick’s command, ended in tragedy. The flying boat and crew were lost off Pago Pago, Samoa, on the northern leg of the journey to San Francisco. [This is incorrect, the aircraft had just left Pago Pago on its way south to Auckland. – Ed.] Further services were postponed until July 1940. The New Zealand public felt the loss keenly. 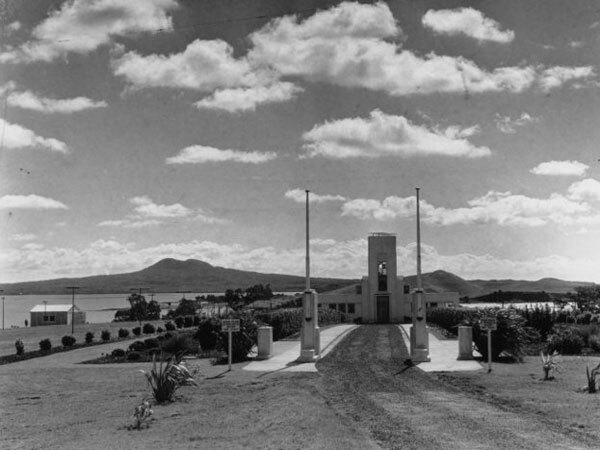 Prime Minister Savage announced the memorial in the form of a beacon would be erected for the direction of aircraft arriving at Auckland. 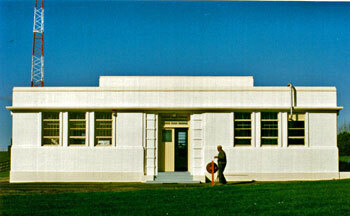 In 1939 temporary buildings (superseded just over two years later) were erected at Musick Point to provide the radio communications facilities and navigational aids required for the inception of the New Zealand – Australia air service by Imperial Airways on 30 April 1940. Pan American Airways commenced scheduled services between New Zealand and the United States later the same year; however, these ceased early in December 1941 with Japan’s entry into the war and were not resumed until June 1946. When the stations opened in 1942, the Post Office operated both aeronautical and maritime communications from the sites. With increasing air traffic, however, the Civil Aviation Department took over the upper operations floors in 1952. The Post Office continued to operate the shipping section from the ground floor. 6. Transmitting Station at Oliver Road. The Oliver Road site – which includes the transmitting aerial paddock, transmitting station and grounds, and the two remaining staff houses -is believed to be up for sale. Telecom Company spokesperson Hugh Scott says the residential-zoned site became surplus to requirements when the radio service closed last year. The land, about 4.8 hectares, is estimated by real estate agents to be worth about 15 million. 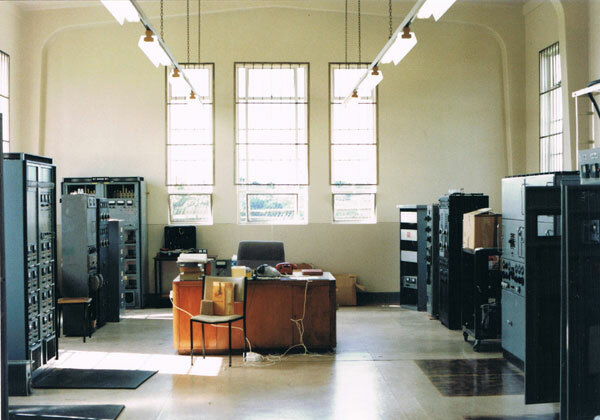 That the transmitting station be acquired by the Manukau City Council as a community facility. The size of the transmitting station hall and the adjacent rooms are ideal for meetings, sporting and cultural activities. The building itself is of very sound construction and very low maintenance. It was repainted some two years ago. It is also well secured, with security guards on all windows and burglar alarms. It is suggested that the Manukau City Council acquire the building – including car parking and access – in lieu of the 6.5 per cent reserve allocation, payable at the time of sub-division. It is estimated this would result in an area of some 3120 sq. metres being added to the existing Maclean’s reserve. There is a chronic shortage of this type of facility in the Bucklands Beach peninsula area. In addition, it would preserve an historic building, one of the very few associated with the peninsula. Medium-wave DF aerial towers at Musick Memorial Radio Station can be seen near the centre of this photo c1961. 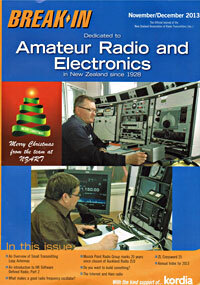 Whites Aviation feature on Auckland Radio, featuring photos taken in 1946. 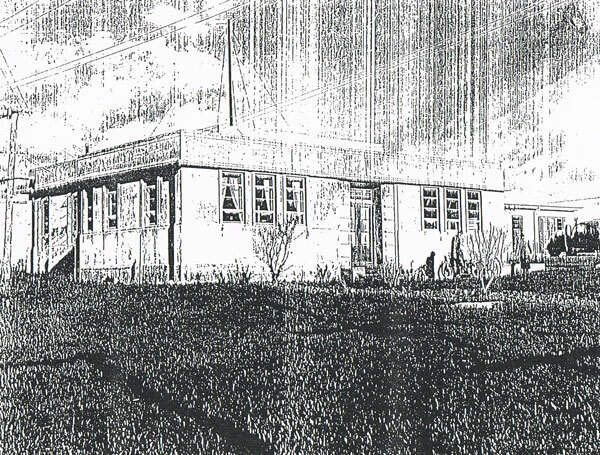 Musick Memorial Radio Station in 1946, seen from the southwest.